Apparently the flower is Lochnera rosea, which could be a periwinkle but might be a frangipani, who knows. Within the familiar circle there’s a more fortuitous octagon – the word for eight in Mandarin, ba, sounds similar to the word for wealth or prosperity, fa (the same is true of Cantonese). Hence the coin is a lucky ba gua, or locally, pak kwa – an ‘eight symbol’ that’s important in feng shui – and exerts a little bit of fortune over everyone who has one. One of my colleagues claims the coin has an interesting back story. When the MRT (underground train) tunnels where being dug in the 80s, a venerable monk advised the government that the construction would be very bad for the island’s feng shui or balance. He said the only way to counter it would be for everyone to carry pak kwa, but he couldn’t see how it could be achieved. 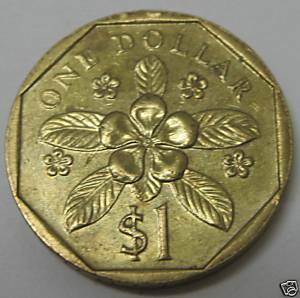 Wise Mr Lee realised that everyone carries small change, and the octagonal dollar was born. I’ve been trying to verify this story online and have only found a few references, none of which seems very reliable, but I really hope it’s true. I love the idea that it’s only capitalism that stops Singapore from sinking into its own dragon vein.